There is a lift to the library from the car park. The library has automatic doors, and a hearing loop is installed. The library is all on one level. There is a study area upstairs, together with the Caterham & Warlingham Citizens Advice Bureau. There is a wheelchair accessible lift between floors. 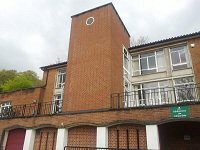 Caterham Valley library has assistive technology for people with disabilities. Please see Library services for people with disabilities for further information. Caterham Valley library is 100 yards along Stafford Road past East Surrey Museum. There are eight parking spaces and two disabled parking spaces outside the library. There are also two supermarket car parks in town.